We are a few short days away from my favorite Holiday - Halloween. 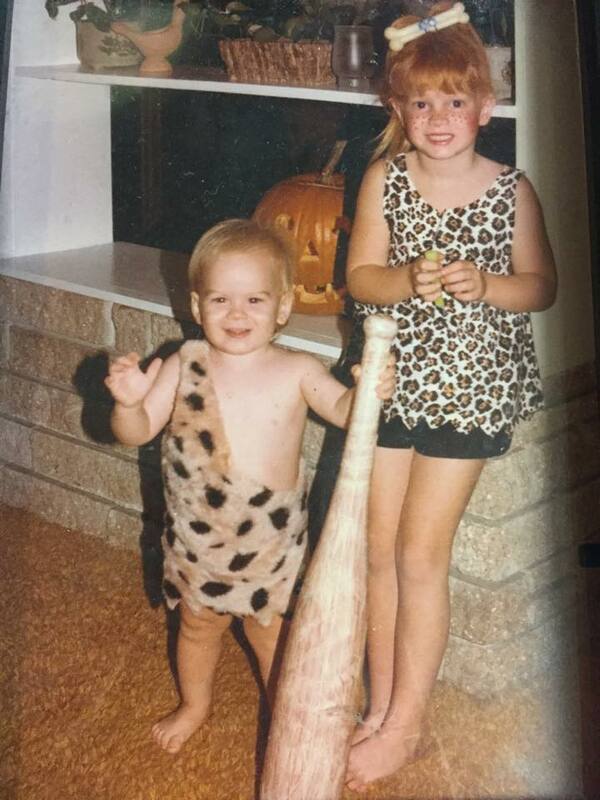 I have been Halloween obsessed as far back as one can remember. As a child, I would help Mom make my handmade costumes. Yes...that is a dog bone in my hair below. As an adult, I always looked forward to throwing Halloween parties. I threw a popular party for many years while I was still in Daytona. 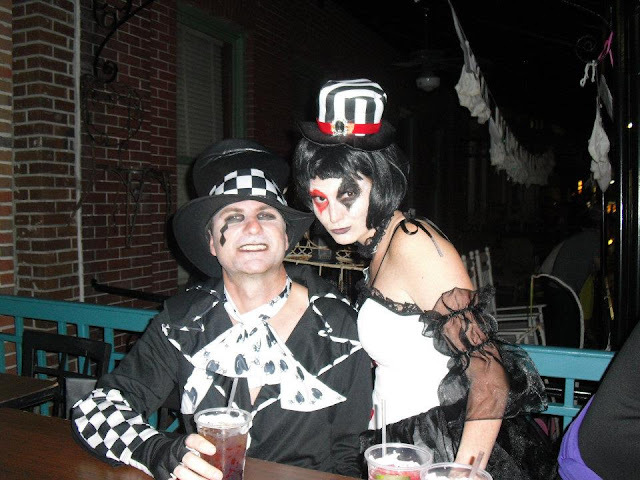 When we moved to Tampa, I did not have the space to throw a party so we started going to Guavaween, Tampa's Halloween party in Ybor City where we lived for 5 years. Throughout the years, we have been many things but we always stayed in theme. 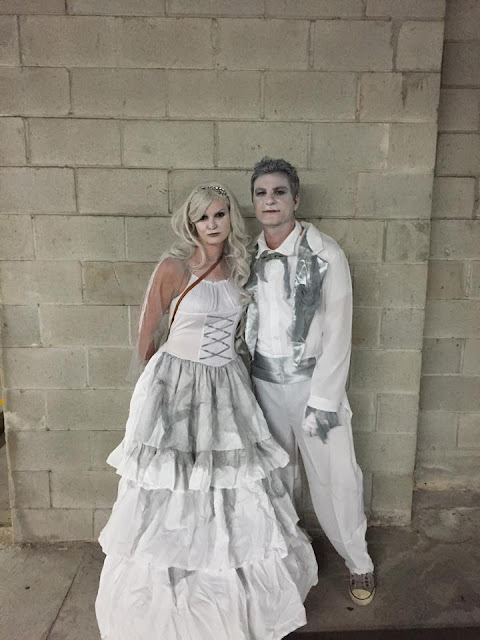 My favorite was the year we got married - a month after the wedding, we went as a ghost bride and groom. Speaking of themes, when I threw Halloween parties, they always had a theme. One of my favorite parties was my Big Hair Ball. It made people think outside the box. 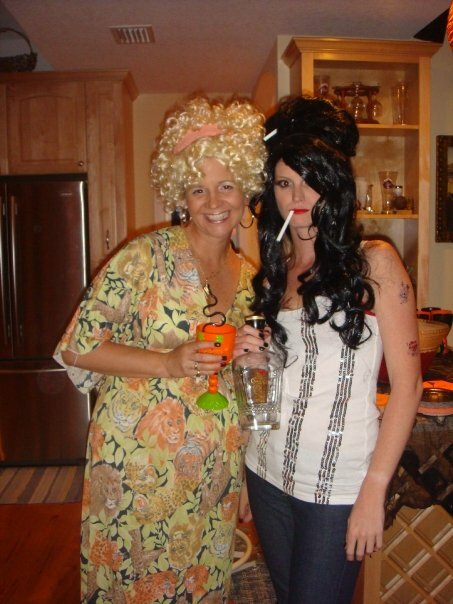 I took advantage of going as Amy Winehouse and my friend Darlynn went as a Blonde 70's sexpot - or is she Magda from Something About Mary?? 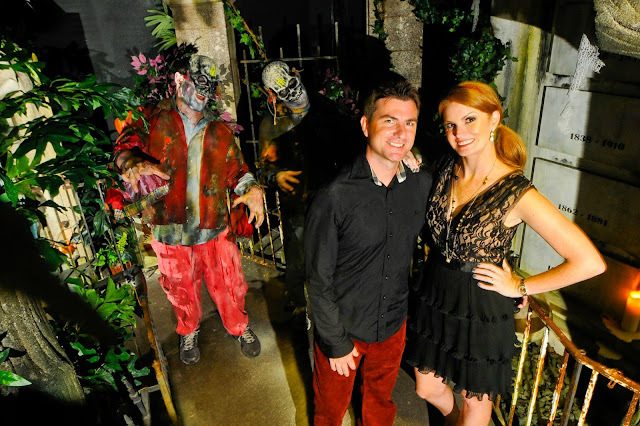 We love Halloween so much that we had one of our engagement shoots at Busch Gardens Howl-O-Scream - Zombies, Voodoo Queens and all! So you can see we take Halloween pretty seriously around here. Now that we have a house, we are looking forward to having trick-or-treaters for the first time since living in Tampa. I have heard it is quite a big deal in our Neighborhood too....to the point that people drive here for the event. I honestly have no idea what to expect and the current debate of our household is if we get full size candy bars (my choice) or miniatures (cheap husbands choice) to give to the kids.. This Halloween, Gabe and I are going as Day of the Dead. 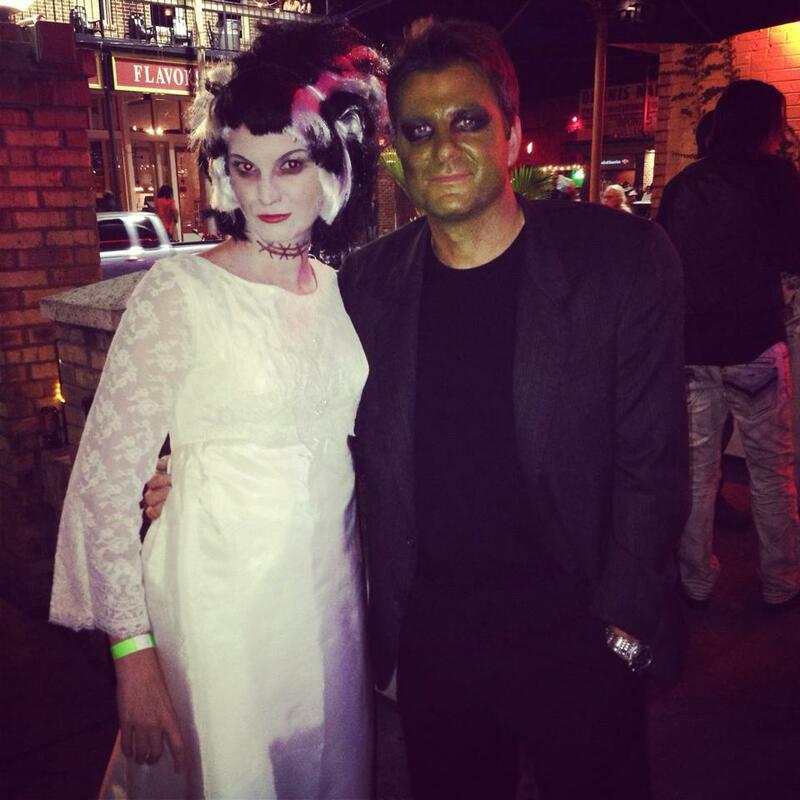 I'm not going to reveal too much about our costumes (especially because I cannot decide between the two I have). We came up with our theme the night we learned we'd be attending Seminole Hard Rock's Monster Ball. After two margaritas and a trip to a Costume store for inspiration, Gabe came across the cane shown in this photo and everything started from there. The next day, Red Diamond asked me to try their Mysterious Red Blend as part of a Day of the Red party - what are the chances! 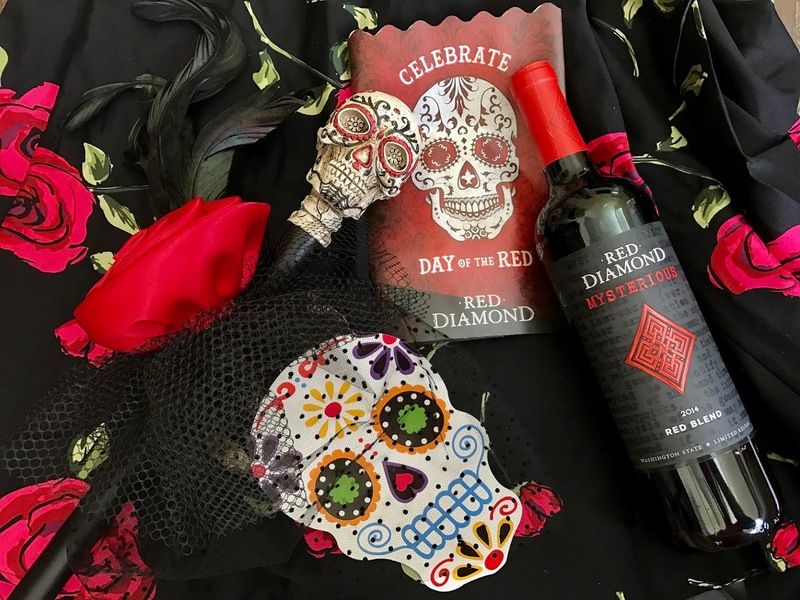 On Saturday night, we will have a small gathering at our house prior to Hard Rock's Monster Ball, where we will be drinking Red Diamond Mysterious Red Blend for Day of the Red. This 2014 Washington State Limited Edition Red Blend has sultry aromas of cherry and dark stone fruit, the palate delivers captivating flavors of dark red berries and a hint of spice. Medium-bodied tannins give way to a riveting, long finish. And it will go perfect with our costumes. For a fun wine pairing, Red Diamond Mysterious Red Blend is fantastic with chocolate peanut butter cups or milk chocolate with English toffee. Of course it also goes perfect with juicy steaks, spooky stews and stinky cheese. You can find Red Diamond Mysterious Red Blend nationwide for $10. The blend consists of 56% Syrah, 40% Merlot, 3% Viognier and 1% other red varieties. This is the wine you want to bring to your friends Halloween party!